One Sunday at Delhi’s Lodi Garden Restaurant, about two-dozen children are watching wide-eyed as Kailash Bhatt and his father, Bhagwandas, get ready to perform. 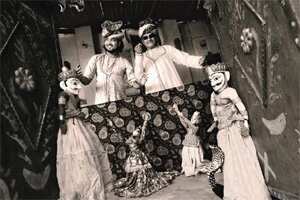 Dressed in a red Rajasthani kurta and a white turban, Bhatt—a tall, lithe 25-year-old with collar-length black hair and a neatly trimmed goatee—straightens a row of six wooden marionettes dangling from a makeshift stage fashioned from cloth and bamboo sticks, while his father fusses with a harmonium. First, Bhatt picks up a 2ft marionette of a dancer, clad in a glittering rhinestone dress, deftly lacing the strings around his fingers. “This is Anarkali," his father booms in Hindi, as he translates: “She is a beautiful dancer. She knows traditional Rajasthani dance…and even a little Bollywood disco." Bhatt twists the string round his wrist?in long, graceful arcs launching the marionette into a sultry dance routine; Anarkali shimmies, twirls and undulates her hips to the beat of the drum, and the shouts and giggles of the children. At the end of her dance, she smoothly scoops up her skirt with one wooden hand, curtsies demurely, and Bhatt removes her from the stage with a flourish, gracefully unwrapping the strings from his fingers and exchanging them for two more puppets with practised ease. Within seconds, he drops two more puppets on the stage—a snake charmer and a snake—and has them perform an impromptu battle to his father’s harmonium. Kathputli (a combination of two Rajasthani words, kath meaning wood, and putli, puppet) dates back hundreds of years . At that time, no court in Rajasthan, a region of princely states, some small, others large, was without its own private puppeteer. Bhatt’s family traces its roots back to a king named Vikramaditya, who employed the first Bhatt to make puppets in his courts. “Since then, the Bhatts have always been puppet makers," Bhatt said. With the fall of the nobility in Rajasthan, the Bhatts were relegated to a nomadic life as travelling gypsies. Bhatt’s father, Bhagwandas, was born in a tent in a remote village in Bihar, and spent his youth travelling through villages across India, performing alongside Bhatt’s grandfather in exchange for food. At the age of 25, Bhagwandas decided to settle in Delhi. Bhagwandas pushes his sunglasses up, a fashion accessory he wears day and night. “We were one of the first families of Kathputli Colony," he says. “We set up our tents and refused to move any more." Originally founded by 11 Rajasthani puppeteers and their families more than 30 years ago, today Kathputli Colony has turned into one of Delhi’s most famous slums—housing more than 3,000 families. Superficially, the colony looks just like any other urban slum—a mess of open drains and labyrinth-like narrow lanes circumventing shoddily constructed houses of concrete and corrugated steel. But Kathputli Colony is populated by the descendents of travelling gypsy performers from all around the country. Bhatt’s next-door neighbour, a burly man in a striped shirt, is a sword swallower and fire dancer. Walking down the street past rows of small shops, Bhatt points out the talents of his friends—a slim man in ratty jeans is a monkey trainer from Kerala, others are traditional dancers from Gujarat, acrobats, sufi singers and musicians. Every so often, bits of colour burst through the otherwise drab surroundings of Kathputli Colony—an impromptu juggling show, a magic trick to charm a child. Many evenings, singing, harmonium and drumming performances break through the mundane drone of cycle rickshaws and street life. “There is so much talent here," says Bhatt, sitting on his roof, gesturing out over the corrugated steel roof tops. At its height, the performers of Kathputli Colony were sought after to perform at Delhi’s most extravagant weddings, festivals, and birthday parties, according to Bhatt. Many of the performers have travelled internationally—Bhatt’s father, Bhagwandas, has more than twenty stamps in his passport, has performed next to the likes of Ravi Shankar, and has twice been invited to perform at the residence of Sonia Gandhi. Bhatt himself has performed in Holland, Russia, the UK, Dubai, Italy, Spain and France, and is engaged to a French-Algerian woman. But such tours are becoming increasingly rare. Today, Bhatt fears that without intervention, kathputli will die out. “With the rise of cineplexes, no one wants to watch kathputli any more," says Bhatt. “Especially in the summers—people prefer to pay ₹ 300 to sit in an air-conditioned theatre for three hours. No one wants to see a traditional show." Even more disturbing to Bhatt is the realization that many of Kathputli Colony’s youth are not interested in learning the arts of their parents. Dancers are eschewing traditional dance in favour of Bollywood moves. Others are embracing more lucrative careers as disc jockeys and event planners. “They are not interested in the traditional crafts because they see no future in it," he says. After the show at Lodi Garden Restaurant, Bhatt’s father slowly packs up his harmonium, gazing out at the giggling children as they disperse—some go to get henna tattoos, while others go to watch a magic show. “Kids still love this at parties, and when we sing and play the adults like it also," he observes. “We have been doing this because it is our heritage. We have been doing it for our children—but without support, we will not be able to continue. Slowly, I think, it will fade out. We will not be able to sustain it."